Having garnered much attention following Giant Bomb’s efforts in putting the game through its paces, Funky Barn was already able to achieve cult status among gamers prior to launch. Its Miiverse community board remains one of the most popular on the Wii U, posts full of wit and humour even from those that have yet to investigate its delights for themselves. For this is a game that, contrary to its name, lacks any funk at all. You’ve inherited run-down farmlands which have fallen into disrepair since their previous owner, Professor Hatsworth, popped his clogs, and it now falls to you to turn things around as best you can. Presentation from the outset is fairly lazy, cartoon images presenting the narrative with no supporting dialogue – neither in text or voice form. Loading is accompanied by a cow fumbling its way along the screen, and you’ll be staring at the unemotive bovine for a while. Farmer Rufus is on hand as your guide, popping up every now and then to provide useful tips that will help to steer you toward success and get you started. Your early time with the game taking you by the hand, before letting go and granting you freer reign over your farm construction. Harry the Chick was the first animal to arrive, each of these delivered no less by a stork. Yet he didn’t last long, having become inattentive to his needs. Animals require food, water and shelter, as well as a pleasant locality to wander around. Ignoring such criteria sees their Happiness level dwindle, eventually seeing them abandon the confines of your farm, so this soon becomes an immediate priority. Your continual goal is to raise your Farm Quality, with animals, plants, buildings and machinery all contributing to it. 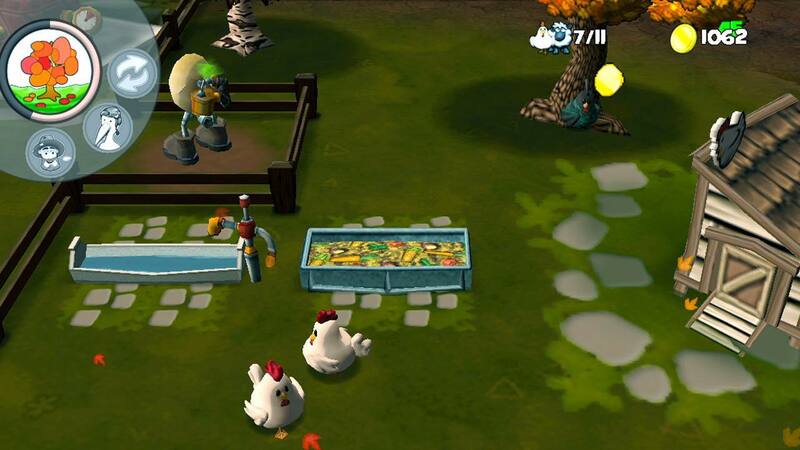 When filled, you can then progress to the next level, unlocking new animals and content to populate your farm with. Seasons also come and go, playing an integral role within the game. For instance, whilst chickens lay eggs all year, they will produce more in Spring, but become slower to do so during Winter. It is imperative that you gather produce such as eggs, wool, milk or corn, to then throw them into your cannon so they may be blasted away and sold to grant your income. This can then be spent on expanding your farm, buying fences and barns to house your livestock, machinery to gather aforementioned produce, or defences. Yes, defences. Whilst crafting your ideal farm, you’ll face numerous threats. Guard dogs and aircraft hangars prove a necessity in protecting you from wolves and the extraterrestrial, out to ruffle a few feathers or beam up cows from your fields. Thunderstorms and Tornados also appear, the ferocity of the latter damaging structures and whisking away any animals within its path. Trade Offers from neighbouring farms grant the opportunity for extra income, if you can send the requested produce within the time limit. Whilst upgrades to structures and machines will similarly be able to increase the rate at which income can be generated. As you progress, you’ll eventually reach a point where the game will plateau. The gradual purchase of numerous automated machines meaning that your farm will be able to run by itself with little direct involvement from the player. Whilst an inevitable sense of accomplishment will be felt, it needlessly diminishes the role of the player to near redundancy – reduced to simply filling water and food troughs. Beyond this, three Challenge Farms promise to keep you further occupied. With these you don’t start from scratch, instead inheriting a run down farm in which you’ll find dry lands, damaged buildings, sparking machines and unhappy animals. Therefore you’re tasked with saving them from ruin, restoring them to their former glory before the 20-minute time limit expires. You’ll need to speedily attend to your animals needs before they leave your farm, return automated machinery that have drifted off-road, repair buildings before they explode into smithereens, and strategically place Water Towers to revitalise your lands. Whilst the initial level eases you in, the latter levels become frantic as you rush around addressing the problems that arise. This dynamic works especially well for Funky Barn, especially compared to the rather open-ended nature of its central mode. The quicker you succeed the greater the score that you achieve, although it’s a shame these can’t be uploaded to an online leaderboard. There’s always Miiverse, I guess. However, with only three Challenge Farms available, the fun is short lived. Your completion of the trio goes relatively unnoticed by the game as nothing else unlocks, only the opportunity to replay each to push for higher scores leveraging additional plays. Tantalus Media employ insightful use of the Wii U GamePad, which expedites your navigation and perusal of the game’s sights and sounds. It’s coloured overlay handily allows you to easily identify individual elements, whilst access to menus such as the General Store, Objectives, Trade Offers, and Map Overview proves intuitive and responsive at the mere touch of a button. The cartoon-inspired visuals in Funky Barn lack the charm of other games of its ilk, graphically looking rather dated overall. Animal models themselves showing little character, highlighted through the limited interaction that you can have with them. Regardless, Funky Barn still proves an undeniably addictive experience although this soon becomes its greatest problem. With the content able to be beaten in such a short space of time, that addiction will inevitably lead to immeasurable disappointment. Still, a younger audience will easily repeatedly lap it up and start their farm over again, but older players will turn most likely wish to turn their attention elsewhere.